To spark discussion, the Walker invites local artists and critics to write overnight reviews of our performances. The ongoing Re:View series shares a diverse array of independent voices and opinions; it doesn’t reflect the views or opinions of the Walker or its curators. Today, filmmaker and writer Justin Schell shares his perspective on Thursday’s Sound Horizon concerts by Grouper. Agree or disagree? Feel free to share your thoughts in comments! That, combined with Cruzvillegas’ simultaneously overpowering and intimate structures, had me thinking about sympathetic spaces (To whom? For whom? To what?) and what makes up these spaces. The Sound Horizon series has offered a wonderful venue for such explorations in sound, held as it is in the Perlman Gallery, a space which can offer its own collaborative voices, be they sonic or visual, to an artist. Last night’s trio of sets by Grouper marked the end of this season’s Sound Horizon series. “Grouper,” of course, is also a type of fish, but Harris’ name choice lends a different valence to what she does. It’s a clunky name, really, but her music is anything but: it has a much more intricate, almost woven, texture to it, with the digital gauze of her guitar and vocals meshing seamlessly with the pre-recorded ambiences and drones, some of which are created through loops played on a tape recorder. While the set I saw was mostly songs linked together by beds of noise that sounded like they could have been, at some point in their sonic life, water waves, Harris conceived of the performances as a triptych, moving from structure to abstraction, with the last set comprised almost entirely of tape collages. 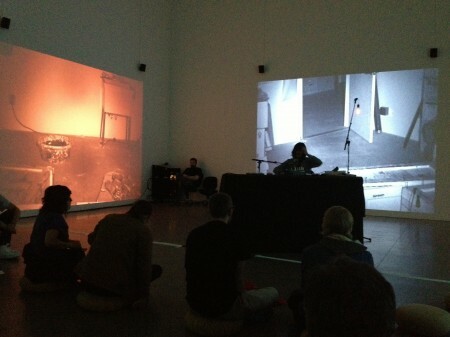 Truth be told, Grouper’s music was made much better by the space surrounding it, both the cavernous quality it gave to her already-reverbed sounds, but also the immersive, multi-projected videos of Bruce Nauman’s MAPPING THE STUDIO II with color shift, flip, flop, & flip/flop (Fat Chance John Cage). While the projections were nearly static, almost “night-vision” shots, what you saw were the other beings who lived in the space: a black cat, mice, bugs. These beings would dart across the screen seemingly in all directions (“flip” is an editing term for turning a piece of footage upside down, while “flop” means to make the footage perspectivally backwards). These seven screens surrounded the audience, offering a different type of immersion, simultaneously providing a sharp visual counterpoint to the music. There wasn’t any specific stage lighting (the illumination came from the Nauman images), meaning that Harris herself was enveloped in the same light (or non-light) as the audience. There was, however, an archaic light fixture that reached out from the desk, and its luminosity swelled with specific sonic moments. My friend said it looked like a firefly, and Grouper’s music certainly had the kind of meditative, but also slightly melancholic, character of the end of a summer’s day, as if those flashes of light represented by the bugs in Nauman’s studio were carefully drawn out and set to music. In the end, I’m not sure what might have been the objects or agents of sympathy in Grouper’s organizations of sonic matter. Flipping to another meaning of the word, and away from whatever intentions she might have had, the evening was more about sympathetic resonances (sonic and otherwise) between the evening’s multiple spaces—structural, sonic, and visual.